There is a saying that a set of Nam Prik or Thai chilli dip with assorted vegetables makes a complete Thai meal. 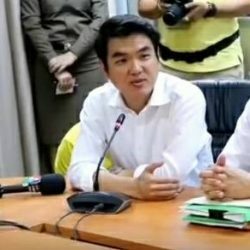 And that is true when you consider how a typical meal in Thailand is usually arranged and served. 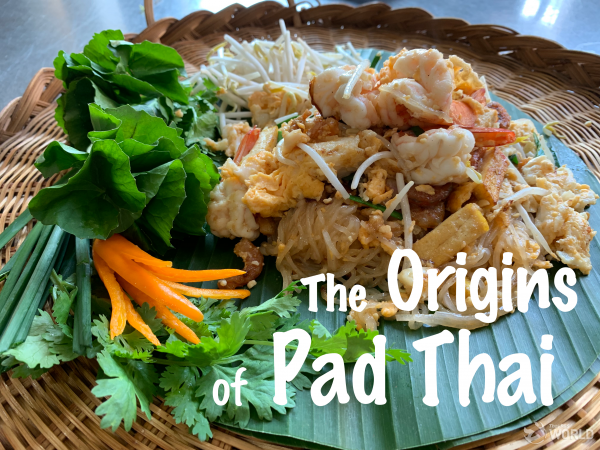 Now that we are having a big Thai food renaissance in the Kingdom, it is a good moment to take a closer look and see how Thai people usually eat. 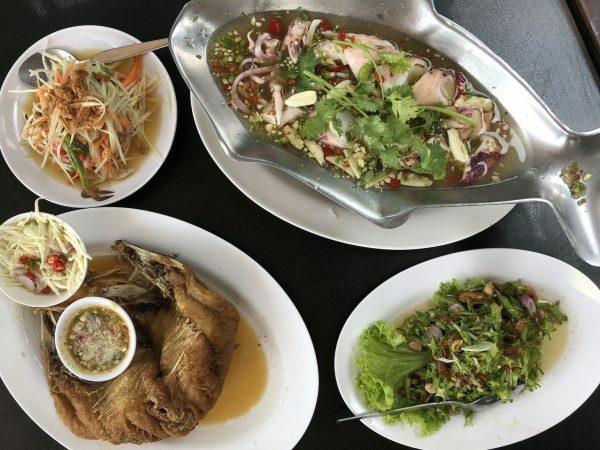 Even with the now widely-practiced multi-course servings of Thai foods in many modern Thai restaurants, a Thai meal, when it comes to the gist of it, is still eaten as a communal, all-at-once kind of a deal. We call this style ‘Samrap,’ and that means a good, complete, well-balanced meal with assorted savouries to be shared over an individual steamed rice. For me, the word Samrap conjures up a remnant of the past when living together in a big, extended family was a norm. The kitchen in a Thai house was usually spacious, mostly open area back of the house, and perpetually busy with people coming and going and cooking most of the time. The house’s central refrigerator was ideally of an ample-sized, and must be durable enough to sustain the day-long opening and closing by the perpetually hungry little ones who always roam the kitchen looking for food. I think the origins of a ‘Samrap’ derived from the fact that in such a big family, a meal should be diverse enough to please everyone. Spicy dishes for those who like it, milder tasting dishes for the kids and things that are delicious yet not too harsh and tough for the older ones. Putting those into a daily consideration and you get a wholesome, tasty Samrap for a family. But then, there are also some tangible theories for arranging a Samrap, too. 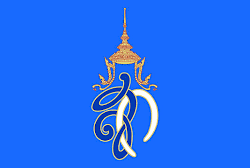 Thai dishes vary greatly and carry different flavours, and the selection typically means they complement each other in terms of tastes and texture, too. 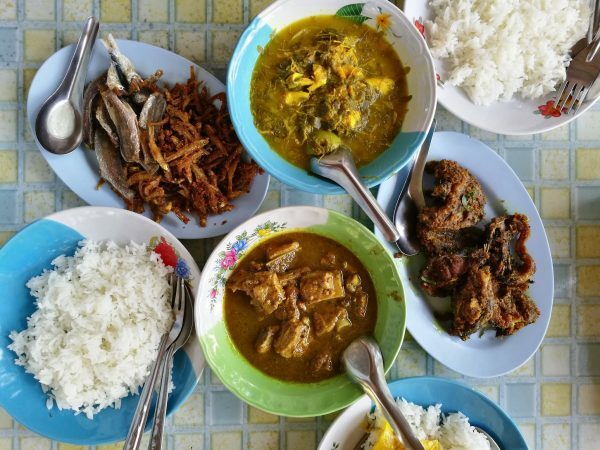 Here are some classic pairings – a type of coconut-based curry with a choice of deep-fried meat or a fluffy Thai-style omelet; a bowl of Gaeng Som – or the clear and spicy curry – with a dish of crispy fried fish. Spicy with salty. Sweet balancing the sour. Fresh vegetables enhance the taste of a chilli dip. In the south, where local curries can be very fiery, a big platter of assorted vegetables, fresh, blanched and pickled, is a perpetual staple. Along with a basket of pre-boiled eggs to mollify the hard chilli tastes. Regional cuisines also have their own arrangements of Samrap, too. And it vividly reflects the way they eat. 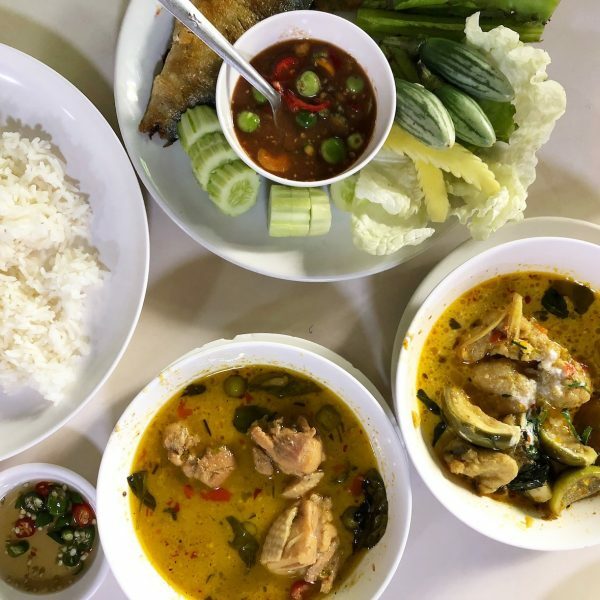 When you go to an Esan (Northeastern) restaurant, or an Esan town, chances are you will be eating sticky rice and things that go well with it. 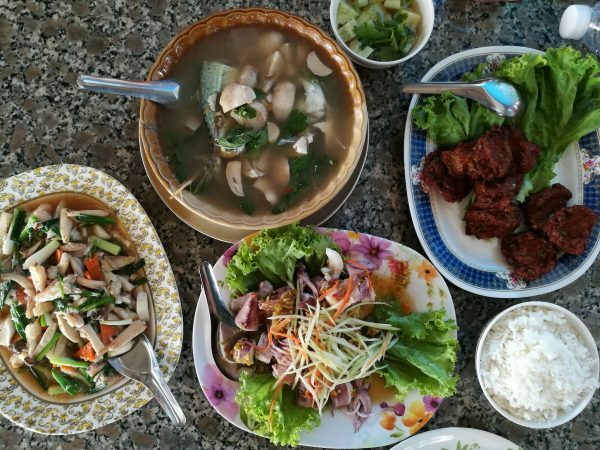 A typical Esan meal usually consists of a plate of somtam, laab (minced meat spicy salad), grilled meat or chicken and a plate of fresh veggies. 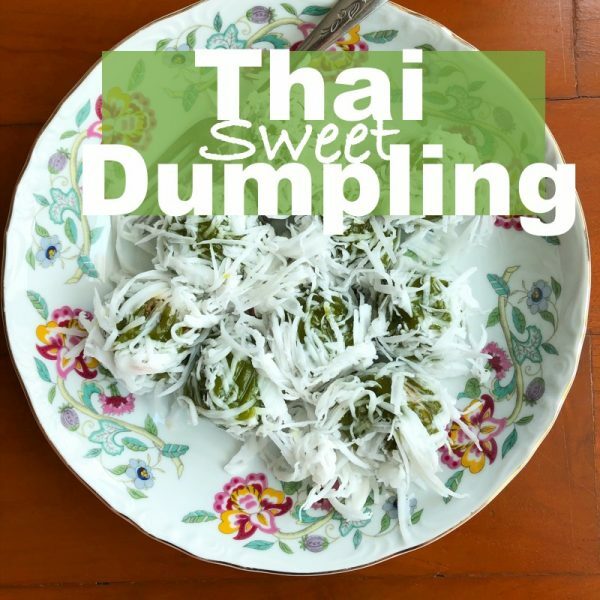 In the North, where sticky rice is also a staple, their matching savouries differ based on the permeating cuisines from Burmese and Laos. Their Hang Le curry has a hint of mixed spices, an extra taste that distinguishes their local cuisine from other parts of the country. 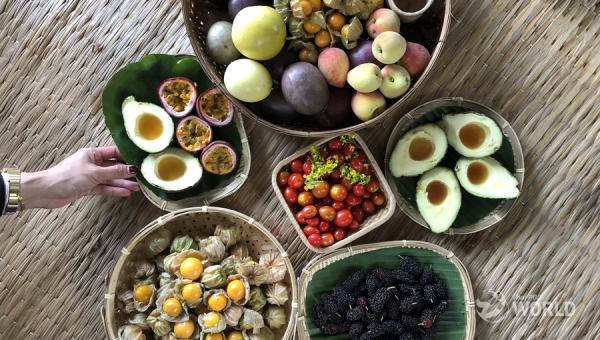 As for the coastal area of the East, you will see fresh tropical fruits in many savouries. 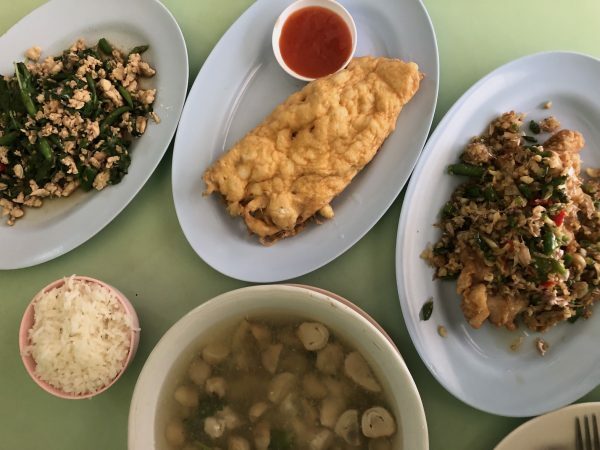 While they still make massaman curry the way anyone in Thailand would do, people in Chantaburi opt to replace the chunky potato with big pieces of their own local young green durian. The mild scent of durian makes their massaman special. And delicious. 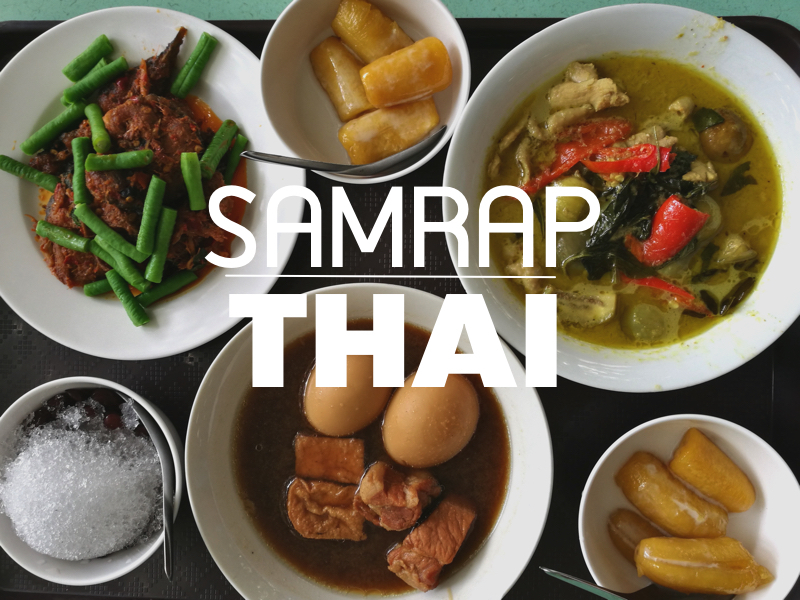 Samrap represents the Thai traditional manner of eating together. The number of dishes in a Samrap vary depending on the number of eaters. In a big family with members spanning maybe two to three generations, there can be as much as five to six savouries to be shared. There is usually a centrepiece dish which can be a curry, a deep-fried fish, or a set of namprik. For the sides, it can be deep-fried pork, chicken, or omelet. Tom Yum, if it makes appearance on that table, will be shared. Either with a communal spoon, or passed along into individual smaller bowl. Tom Yum is never a soup course in Thai meal because everything on the table is intended to be eaten together. And you can find a Samrap in a classic Thai rice and curry stall, too. With eclectic dishes on the offer, eater can pick and choose their own personal Samrap in one plate. You can try it when you are in town. 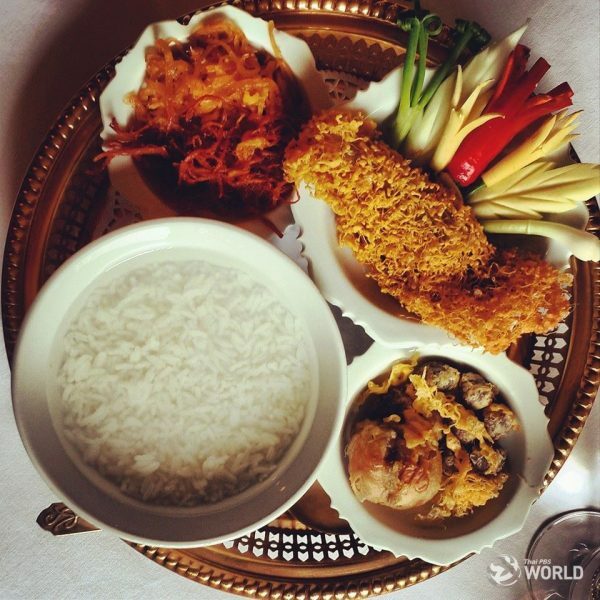 Over a plate of steamed rice, pick your own savouries that you think go well together and will make your meal wholesome and delicious.